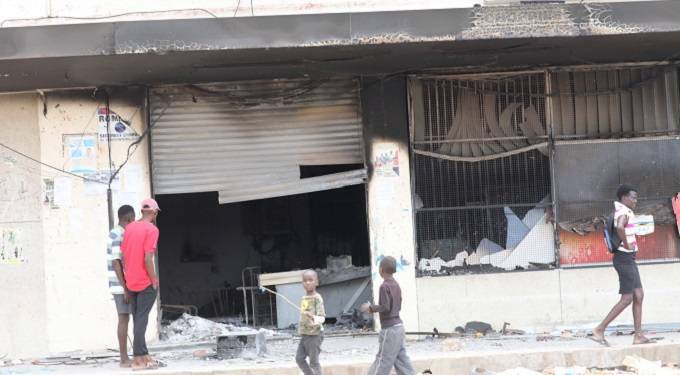 AS the country comes to terms with the massive losses arising from the violent protests in January, the livelihoods of two elderly widows, Mrs Molly Malunga (67) and Mrs Sally Maplanka (73), have been shattered as the two shops that were their source of income were burnt down. Both Mrs Malunga and Mrs Maplanka were renting out their shops in Pumula East and New Lobengula respectively to retail giant Choppies Enterprises which was one of the companies worst hit by the violent riots. Mrs Malunga is the widow of Joseph Malunga who was the brother to national hero and veteran nationalist, Sydney Malunga while Mrs Maplanka is the widow of one of the pioneers of the black business community, Zeblon Maplanka. While the situation in the country has returned to normal, the future looks bleak for the shop owners who now face the daunting task of picking up the pieces of their disrupted lives without their main sources of income. Mrs Malunga told Sunday News that life had taken a turn for the worst for her family, as they were now unable to get any returns from a shop that was built by her husband 40 years ago. “What happened is very painful. It doesn’t sit well with us. It’s a huge loss for us because this was our livelihood. We were working well with Choppies and even now we have good frank discussions with them on where to go from here and whether we’ll be able to get some assistance even from Government. For now it’s promising,” she said. According to Mrs Malunga, they are now stranded as they can not turn to Choppies as the company is also licking its wounds after the massive losses they suffered during the protests. Choppies Enterprises has said it lost stock valued at $2,5 million while equipment and assets worth $6,5 million were destroyed after nine of its branches were attacked by violent demonstrators and looters. “We haven’t been paid because it would be unfair for us to go and demand money from them when they’re also crying about this whole situation. We’re waiting for them to first get their house in order and determine how they’re going to be able to move forward. Only then could they be able to call us and tell us the way forward. If they restock then we can map a way forward,” she said. With their source of income reduced to ashes, Mrs Malunga said they did not yet know the full extent of the damage. Built by Mrs Malunga’s late husband in 1979, she said that the shop had sustained her family even when her late husband, the family’s breadwinner, fell ill. The family started renting the shop to Choppies in 2012. Four decades after they opened their doors to the public, Mrs Malunga said they would be out of business for the first time as they had never seen such wanton violence in the shop’s existence. She said she was unsure when the shop would be operational again. Fellow shop owner Mrs Maplanka said her burnt down shop had also been her main source of income, keeping her on her feet after the passing away of her husband. “We were working well with Choppies before all this happened. This money was taking care of me and four of my grandchildren. This is where we got the money for school fees and even rentals. We built this place when my husband was alive in 1992. We had the shop and I was working there until we started renting it to Choppies in 2013,” she said. Mrs Maplanka said she was in the dark about how much was required to get the shop operational again.